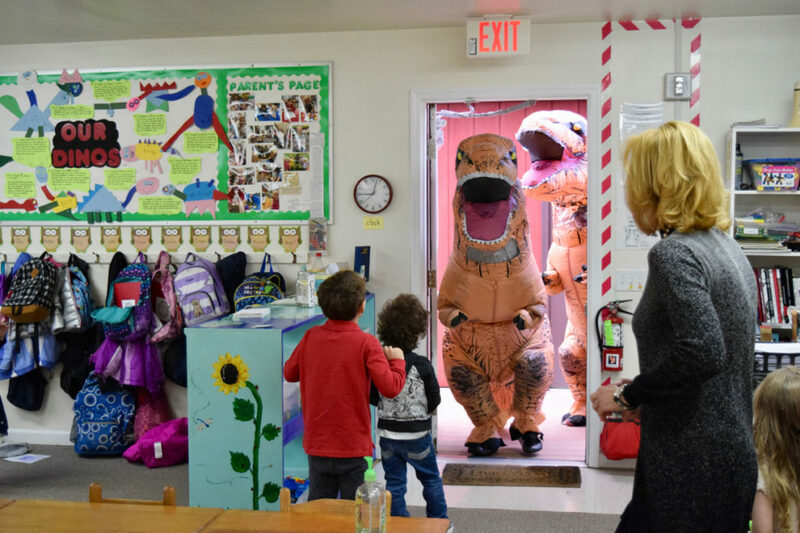 If you were in Flint Hill last Wednesday, you may have spotted two giant T. Rexes on the campus of Wakefield Country Day School. Not to fear, though. 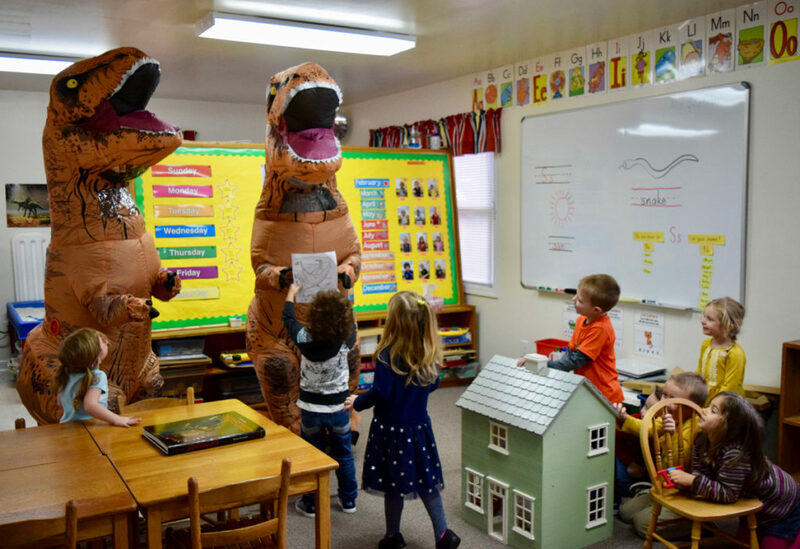 Those T. Rexes were promptly vetted and did indeed have permission to visit the very excited children in Mrs. Shafran’s Pre-K classroom. “We knew ahead of time the dinosaurs would be visiting, so the moment the Tyrannosauruses entered campus, we gathered at the window and watched them approach, dancing happily on their way. When we saw that the dinosaurs didn’t eat Mrs. Lindstrom, we invited them inside,” recalls Kim Shafran. Once in the classroom, the students enjoyed meeting their friendly visitors and shaking their itty bitty hands. The youngsters knew a few fun facts about T. Rexes and shared these points with each guest: Rex means king, so he was king of the dinosaurs; his teeth were as big as a banana, and very sharp; his arms were so short he couldn’t scratch his nose; some scientists think he had feathers on his head; he had a keen sense of smell; and he was smarter than most dinosaurs. After spending a little time together in the room, “we decided we could run as fast as dinosaurs, so we challenged them to a race outside,” says Shafran. Giggles and laughter soon filled the front lawn of the school as tickled spectators cheered for one and all. 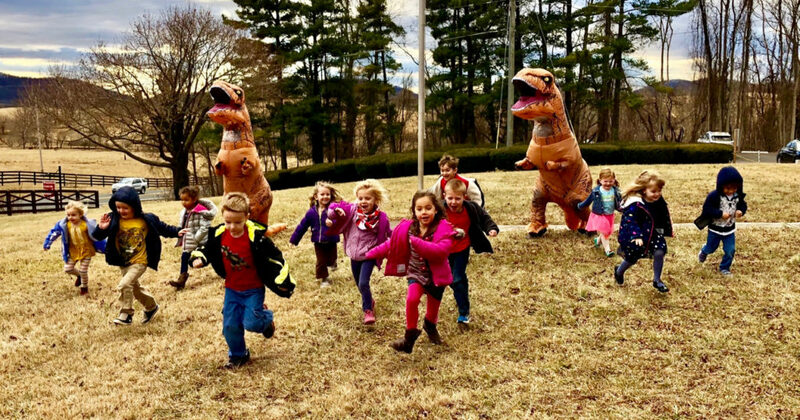 Sure enough, the children of WCDS outran those big T. Rexes of Rappahannock County. And after a display of fine sportsmanship–with itty bitty handshakes–the children and dinosaurs said their goodbyes.